Eastern Yellow Robin – more than meets the eye! 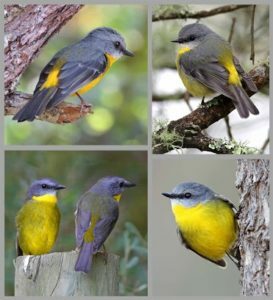 Monash University is conducting an amazing study on the genetics of a local woodland bird, the Eastern yellow robin right here on our doorstep in the Muckleford and Newstead forests. Lana Austin from Monash University is living in the Newstead area and coordinating volunteers for mist netting of Eastern yellow robins, and wild observation of banded robins. Lana introduces the project below. Eastern yellow robins. A common woodland species. Not endangered. No fancy breeding displays. Easy to spot. So why is Monash University putting so much effort into following every move of these birds? Well, it turns out they are more remarkable than once thought. Recently we discovered two unexpected genetic lineages in our familiar robins. These lineages lie neatly to the east and west of the Great Dividing Range. While they are genetically distinct, even with the best pair of Swarovski binoculars the two lineages look exactly the same to the human eye. Here’s where it gets really interesting. Along the east and west boundary there are sites where the two genetic lineages coexist (e.g., Muckleford State Forest, Crusoe Reservoir, Bendigo). So, they are hanging out together but maintaining ‘genetic purity’. This means that while we can’t see the difference, the birds can. We are witnessing the Eastern yellow robins split into two species! This raises some interesting questions. How do the robins know that a potential mate is the same genetic lineage? What happens when they mate with a different lineage? Would they prefer to mate with a different lineage, or not at all? How successful are the hybrid offspring? Later in May (date being finalised), Lana will be giving a presentation as she unpacks what is known (and not known) about the Eastern yellow robin. Volunteers are most welcome to join the field team from the 5-10 May on their colour banding project. Email lana.austin@monash.edu for more information. Sounds Fabulous! Love to get involved, and participate in survey at Walma, on the Muckleford Creek Walmer. That’s great Eliza! Please email Lana directly to let her know.